Chris and Ashley Dorsey’s beautiful Lowndes Grove wedding is featured in the latest issue of Charleston Weddings alongside so many other gorgeous pages of wedding inspiration. Kristin Newman and Heather Barrie teamed up for this stunner and I love the vibrant palate of pinks, oranges and yellows, perfect for a summer day on the water! Kelley was a stunning bride and I was thrilled to shoot her bridal portrait recently at Lowndes Grove. She wore her grandmother’s gown which was also worn by her mother almost 30 years ago. I’m always amazed that a gown can be preserved and altered and then shared with later generations, but that may just be because my own wedding dress has red wine stains all over it. Good thing I have boys, I guess. Kelley’s gown was altered to be sleeveless but she had an elegant lace bolero made to cover her arms during the ceremony. Add some killer blue Louboutins, a bouquet blooming with roses and peonies, and it makes for an exceptionally elegant bride. I shoot bridal portraits months ahead of the wedding date and it is so difficult not to post the photos once I’ve finished editing them! The bride usually shares them with a few friends and family but I have to wait until the wedding date passes to post anything. Gately and Mikell were married earlier this month and I’m so excited to finally post some of Gately’s portraits! We did these in the middle of June and somehow Gately kept her cool while I turned into a red hot pool of sweat. She’s a pro! Stay tuned for their fantastic wedding photos! 100+ degree heat index, no problem with an air-conditioned tent! Want a big sendoff, why not have two! And while you’re at it, get a scrumptious cake to flawlessly match the Sideshow Press custom designed save-the-dates! Ashley and Chris had a spectacular summer affair at Lowndes Grove Plantation following their ceremony at the Cathedral of St John the Baptist, all perfectly orchestrated and decorated by Kristin Newman Designs and Gathering Events. Ashley’s bridesmaids were classic in little black dresses with lace boleros and bright, eye-popping bouquets in orange and pink. It all looked fantastic against the sprawling grounds of the Plantation, and sounded great too thanks to Plane Jane. Love them. LOVE THEM. Congratulations Ashley and Chris, and thank you so much for letting me capture your wonderful day! And you can see the entire event here. Martha Kent and Michael were married in the fall of 2008 and had a beautifully bright and cheery yellow-hued reception at Lowndes Grove. Ooh Events did the design and set up cushy yellow lounges where guests enjoyed an amazing sunset and hand rolled cigars. Their wedding is in the current issue of Charleston Weddings Magazine. 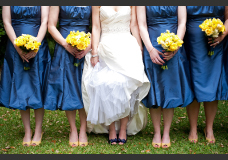 Their wedding colors sparked my obsession with bright shoes. Martha Kent’s maids wore highlighter yellow strappy sandals that really popped against the green grass. Congratulations Martha Kent and Michael!